A view of the Maroon Bells from just below the confluence of East Maroon and West Maroon creeks. ASPEN – A representative of the U.S. Forest Service told Aspen City Council on Tuesday that the federal agency is likely to oppose the city if it files to extend conditional water rights it holds for dams on upper Maroon and Castle creeks. The city has until Oct. 31 to submit a due diligence filing in Division 5 water court in Glenwood Springs to keep its conditional water rights alive for another six years, and the council held a work session Tuesday where it took public comment on the issue. Kevin Warner, who is serving as the acting district ranger in the Aspen-Sopris Ranger District, said legal counsel for the Forest Service at the regional level had advised him that the federal agency would likely submit a statement of opposition if the city filed to extend its conditional water rights. He said that given the city’s ongoing exploration of whether or not it should seek to renew its conditional water rights, the Forest Service also took an “in-depth” look at the rights. 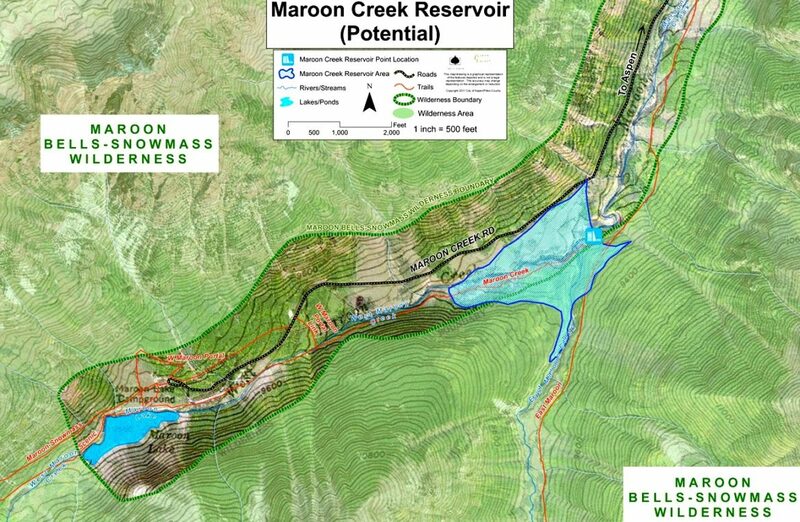 If built as currently described by the conditional water rights, the Maroon Creek Reservoir would store 4,567 acre-feet of water behind a 155-foot-tall dam, just below the confluence of East Maroon and West Maroon creeks. The Maroon Creek Reservoir would cover 85 acres of Forest Service land about a mile and a half below Maroon Lake. The reservoir would also inundate portions of the Maroon Bells-Snowmass Wilderness. The potential Castle Creek Reservoir would hold 9,062 acre-feet of water behind a 170-foot-tall dam located about two miles below the ghost town of Ashcroft. The reservoir, inundating 120 acres, would affect mostly private land but would also flood some Forest Service land within the wilderness. The city originally filed for the water rights in 1965, citing an expectation that it would need to build at least one of the reservoirs by 1970 to meet demands for water. On Tuesday, the city’s director of utilities and environmental initiatives, David Hornbacher, told the city council there could be a gap in the future between the city’s water supply and demand, especially given climate change, but he did not cite the specific size of the perceived gap, or how the potential reservoirs would be used to meet it. He did, however, recommend that the city file an application in water court to maintain its conditional water rights and then look at alternatives. A view of one of the many wetlands in the Castle Creek valley that would be flooded by a potential Castle Creek Reservoir. The U.S. Forest Service has advised the city of Aspen that its potential reservoirs would conflict with management plans for the White River National Forest. Statements of opposition in water court cases do not always reflect a party’s intent in the case. A statement could be simply a way to monitor court proceedings, or it could signal intent to litigate against a proposed water right. In response to Daily’s question, Warner said the agency saw it as a responsibility to oppose the city, rather than an opportunity. Warner said the Forest Service’s opposition to the city’s water rights was based on the fact that the reservoirs would inundate portions of the Maroon Bells-Snowmass Wilderness. 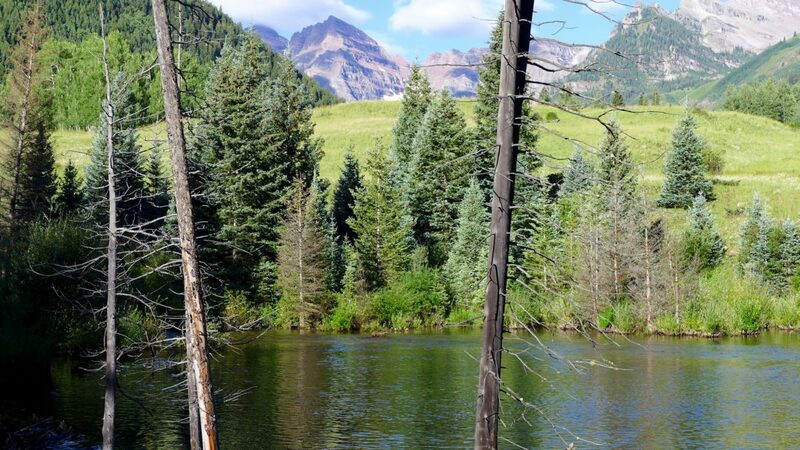 “Based on our understanding of the Wilderness Act, and the fact that there was no exception built into the designation for the Maroon-Bells Wilderness Area … it would need to go to the president” in order for the reservoirs to be approved, Warner said. Without such an authorization, the Forest Service could not support the city’s conditional water rights. Will Roush, conservation director at Wilderness Workshop in Carbondale, told the city council in an Aug. 19 letter that no president has granted such an exemption to the Wilderness Act since it was approved 52 years ago. He also urged the city, on behalf of Wilderness Workshop, to abandon its conditional water rights. This is not the first time the Forest Service has warned the city of Aspen that its proposed dams and reservoirs conflict with federal policy. 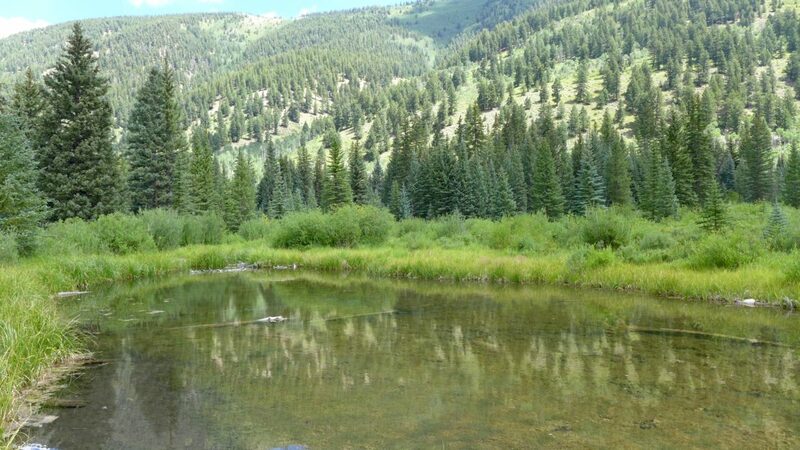 In 2009, the last time the city filed to extend its conditional water rights, White River National Forest Supervisor Scott Fitzwilliams sent the city a letter about its conditional water rights, but did not file a statement of opposition. A map showing the location of the potential Castle Creek Reservoir. The extent of the reservoir has been slightly modified to flood a smaller portion of private property owned by adjacent neighbors. In addition to the likely pushback from the Forest Service, American Rivers has also stated it will oppose the city in water court. Last month, Rice also said in an interview that American Rivers would oppose the city in water court if it filed to extend the conditional water rights. “Rather than prolonging this debate for another six-year diligence cycle, Roaring Fork Conservancy believes now is the appropriate time to cancel these conditional water rights and for the city to pursue any other water demand and supply initiatives,” says the letter signed by director Rick Lofaro. Tasker also suggested that Pitkin County might oppose the city’s diligence filing. 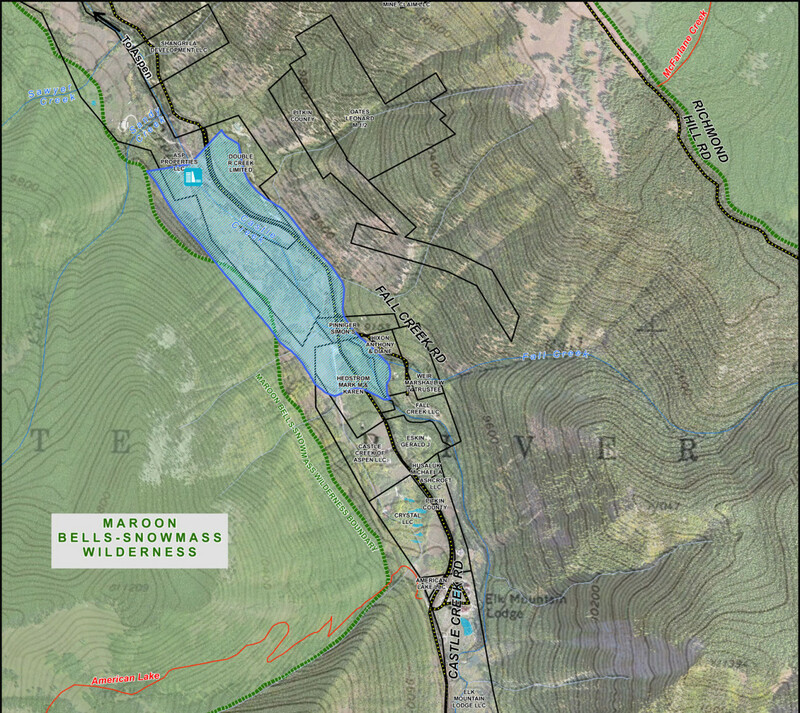 A map produced by Pitkin County, from a map on file with the state, of the city of Aspen’s proposed Maroon Creek Reservoir, located just below Maroon Creek Lake, shown to the left as the smaller of the two bodies of water. The map was commissioned by Aspen Journalism and confirmed in 2012 as accurate by city officials. The city also received a letter from an attorney representing the Larsen Family Limited Partnership, which owns water rights on Maroon Creek. Marcella Larsen of Aspen is co-manager of the Larsen Family Limited Partnership. She’s also a member of the Maroon Creek Caucus, which advises Pitkin County on land use in the Maroon Creek Valley. The city council next plans to meet in a closed-door executive session with its water attorney on Monday about its conditional water rights, and then hold another public work session on Tuesday. It also plans to vote on Oct. 10 whether or not to file to maintain the conditional water rights. Editor’s note: Aspen Journalism and the Aspen Daily News are collaborating on coverage of rivers and water. The Daily News published this story on Thursday, Sept. 22, 2016.